^ Text of Nancy Pelosi's speech. January 4, 2007 [January 19, 2019]. ^ 美國眾議院. Speakers of the House (1789 to present). [2019-01-06] （英语）. 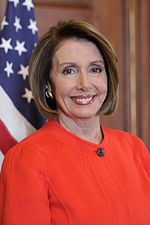 Speaker Pelosi is the 52nd individual to serve as Speaker of the House. In total, 54 Representatives have served as Speaker. ^ Jacob Pramuk. Nancy Pelosi reclaims House speaker’s gavel as Democrats prepare to take on Trump. CNBC. 2019-01-03 [2019-01-06] （英语）. ^ Editor-at-large, Analysis by Chris Cillizza, CNN. How Nancy Pelosi broke Donald Trump. 有線電視新聞網. [2019-01-26].